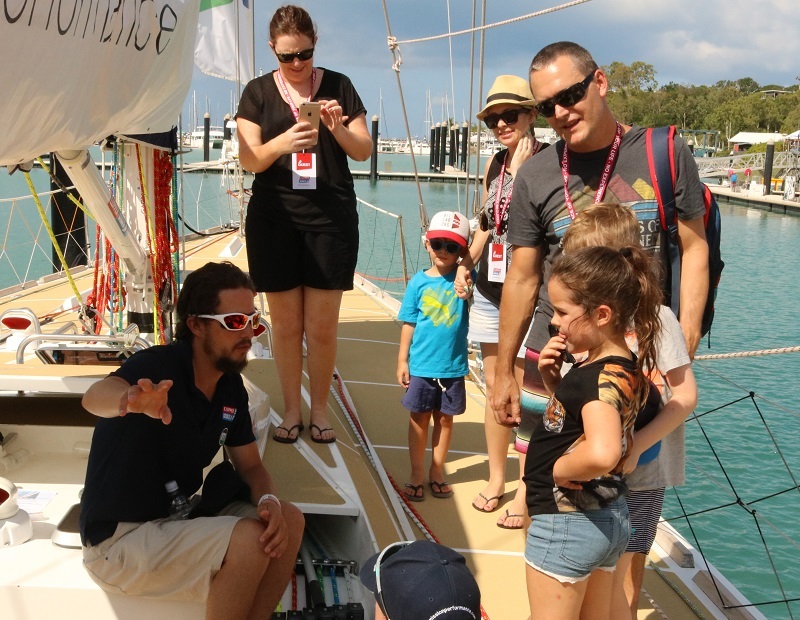 Hundreds of Whitsunday and surrounding area residents and tourists took the chance to tour the Clipper Race fleet today. 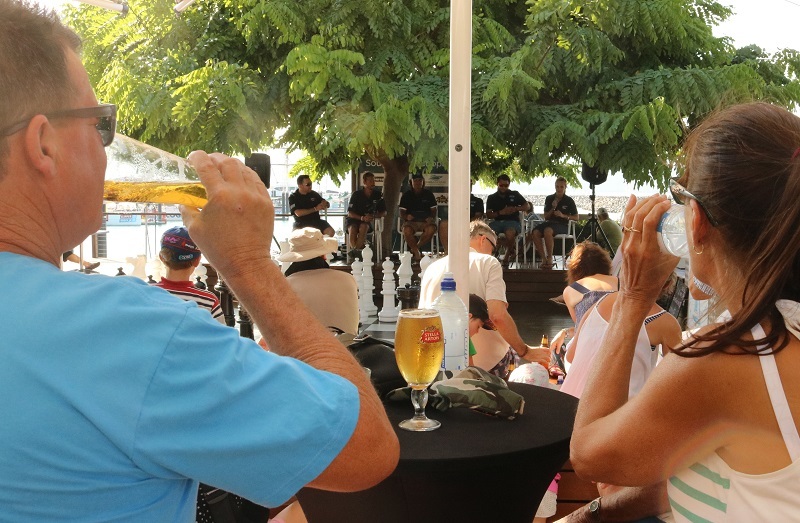 Families and friends enjoyed the tropic sunshine as they received free boat tours and heard directly from Skippers and crew at a special question and answer session on the waterfront. 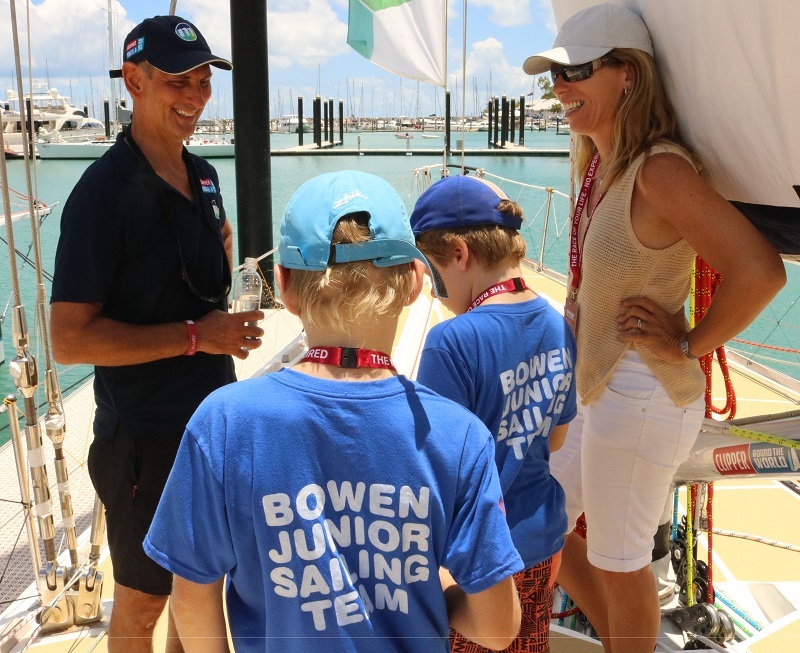 Members of Abell Point Yacht Club volunteered their time in the heat to help organise those who queued patiently and came steadily throughout the day, and helped give access to jump aboard Mission Peformance and GREAT Britain. Terri Mitchell and her friends Diane, Donna and Nancy drove three and a half hours from Townsville. They have known about the race for a while now and became Mission Performance fans after being impressed with the team’s selfless diversion during this past race to Airlie Beach. 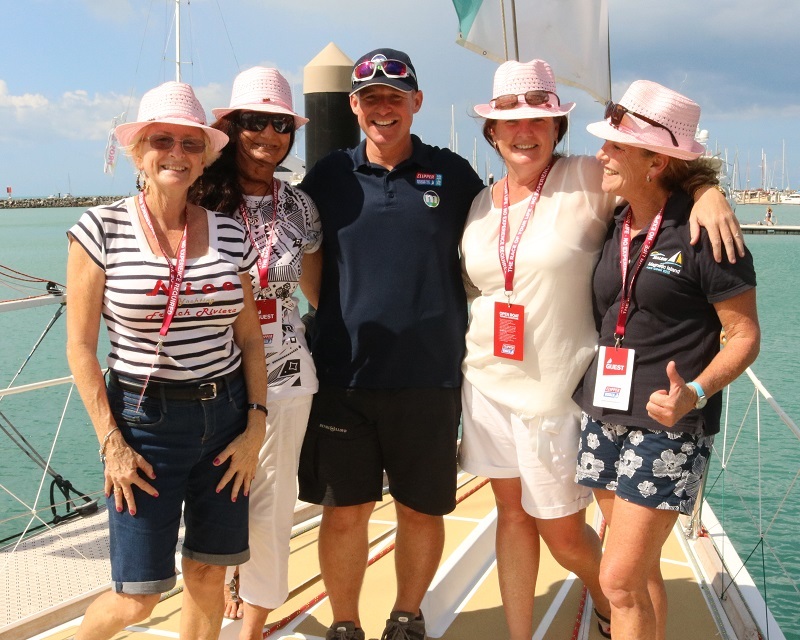 Terri, who had also been in Hobart and had photos of the Clipper Race fleet parading in Sydney Harbour, says: “Diane, myself, Donna and Nancy all sail together and have all been following the Clipper Race for a while now. Though I knew it was a one design fleet racing around the world, I didn’t actually appreciate that there are so many novice sailors amongst the crew. It is even more interesting than we thought actually. “It is brilliant that we were able to come up here and see them so close like this and we found it fantastic that the boats and people have been so accessible. We were especially pleased to actually meet the Mission Performance crew and Skipper Greg. Being a global event, it was really impressive to be able to get such a good inside flavour of it. 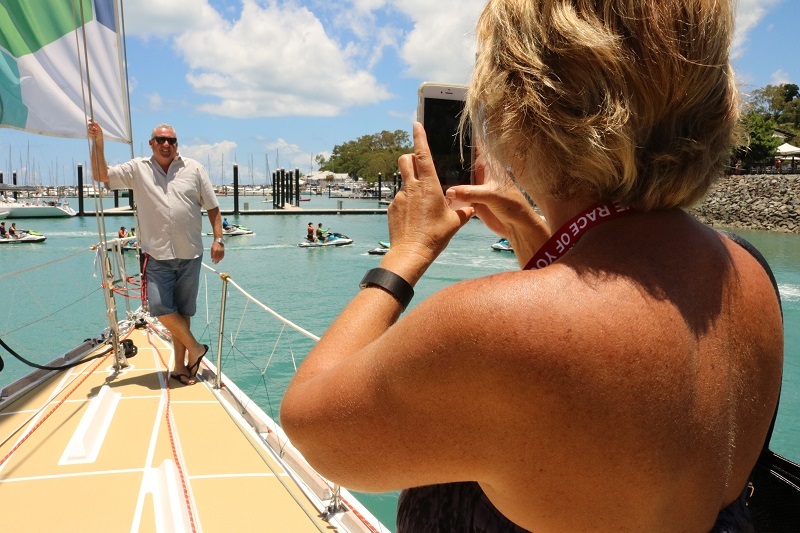 Perri Simpson, Paula Wronski, Nikki Burrows and Andy Neville came from down the road in Mackay to see the boats and listened to the Q + A panel with Skippers Pete Thornton and Greg Miller and members of their crew. Following the talk, Nikki says: “To have such an international event come almost to our doorstep is very exciting. We’ve been very impressed with the boats, and enjoyed hearing from the crew and Skippers about their experiences on the race. Abell Point Marina’s Christophe Vanek hosted the Skipper and crew Q + A session. A highly accomplished sailor, he has competed in many major international regattas including three America’s Cups, 10 Sydney to Hobart’s, five China Cups and many World Championships. 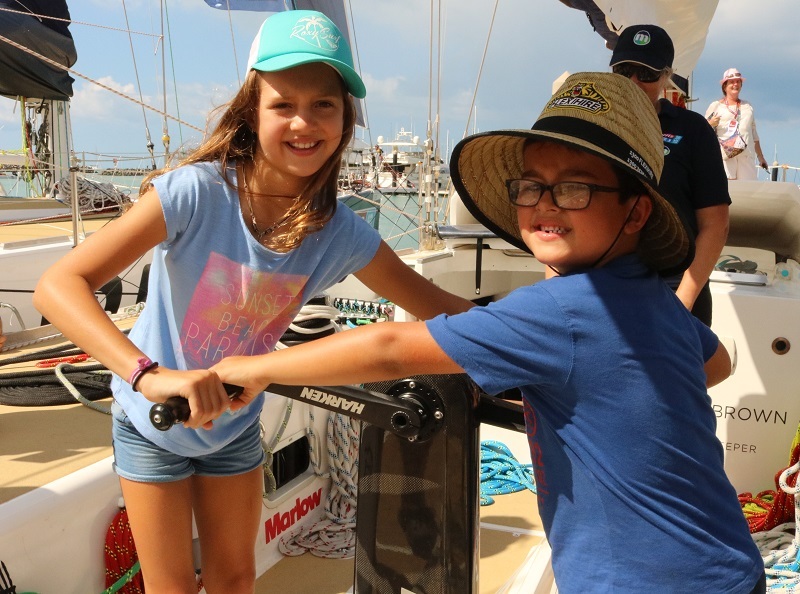 On the Clipper Race visit Christophe said: “Having the Clipper Race in Airlie Beach has caused a great deal of excitement in the local area. People have come from all around to see the boats today and listen to the tales of the challenges the competitors have faced. “Ocean racing is a tough sport. Mentally and physically it takes everything to push yourself and your team through the highs and the low’s that you face. As a professional sailor, I have huge amounts of respect for the crew, who come from all levels of experience, for whom this is an even greater challenge. The community activities continue tomorrow, Sunday 17 January, as crew have been invited to join local residents to compete in an outrigger boating race. Also Skipper Wendy Tuck will be the guest speaker at a ladies High Tea event at nearby Shingley Beach Hotel. The Da Nang New Discovery of Asia Race, number seven in the fourteen stage global series, starts on Monday 18 January.